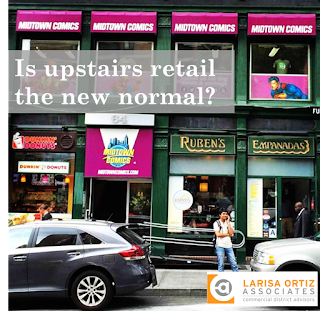 Is upstairs retail the new normal? I was struck by a Crain’s piece I read today entitled “Retailers find bargain-basement prices upstairs“. What they are finding is that there is increased interest in second floor space by some retailers. As certain commercial districts see rapid rent increases in the price psf of ground floor retail space, some intrepid entrepreneurs are findings second floor space more appealing – and certainly less expensive. But there are caveats. This approach does not work for everyone nor can this be replicated in every market. That said, there are retailers who succeed in making this happen . As we like to do here at the office, we took some time to think about when and where we have seen second floor retail makes sense. In general, we have found that second floor retail works under the following circumstances. These retailers are savvy with social media. They know how to use the media and internet to drive visitation because location and visibility, the basic visitation drivers for most retailers, don’t work in their favor. This kind of retail works when the differential between ground floor retail price psf and upper floor psf has to be significant enough to make the upper floor sufficiently worth the trade off. That means stronger urban markets where demand for retail exceeds what can be provided by existing ground floor space. Retailers who make the leap often employ visual aids to overcome the lack of visibility. For example, one retailer in the article hung lanterns up the stairwell to “draw eyes upward.” Sandwich signs, creative lighting, blade signs on the building, window decals…anything that gives a customer reason to contemplate looking up is key. A few years ago our firm did some work on a facade program in Lower Manhattan. Midtown Comics, a destination comic store located on the second floor of a building on Fulton Street, engaged the architect on the project to design great decals and bright purple awnings that were hard to miss. Being on the second floor isn’t for the faint of heart. It requires a heftier commitment to marketing and promotion, but some retailers and restaurateurs are finding that the payoff is worth it.